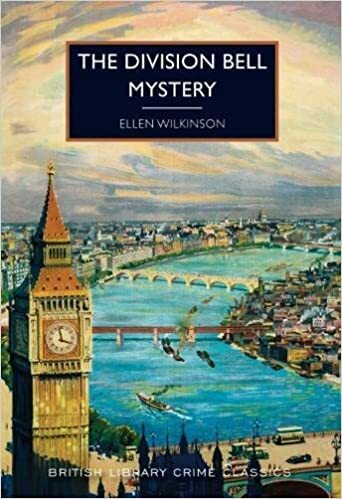 This is a British Library Crime Classic with rare distinction; its author, Ellen Wilkinson, was one of the earliest women MPs in the House of Commons, and its original publication in 1932 was a contribution to the rise of the Golden Age of Detection. Sadly, it was the only mystery novel which Wilkinson wrote, in which she demonstrated a sure grasp of characters, plot and most impressively, setting. More than a seemingly impossible murder, this book has resonances of a political nature as despite her assurance that all characters are “entirely fictitious”, it is possible to see portraits of contemporary politicians. Solidly placed in an environment that could be verified, this is an ambitious yet controlled book in which many points are made about the status of politicians away from the public eye, and the few women MPs who appear in the novel. I was happy to receive a review copy of this novel, which includes a Preface concerning Wilkinson’s life and times by Rachel Reeves MP as well as Martin Edwards’ valuable Introduction which puts this book in its literary context. Robert West is a young, solid and ambitious parliamentary private secretary who has invited an old friend to visit him in the Houses of Parliament. He has also facilitated a meeting between his boss, the Home Secretary and an international financier, Georges Oissel, in a private dining room, to discuss a loan that the Government needs. All seems to be going well until the Division Bell rings to summon all the MPs to vote, and just then a shot rings out. As West and his friend Shaw burst into the room, the body of Oissel is discovered alone with a gun. West decides to discover whether this apparent suicide was in fact murder, especially when a burglary of the financier’s home results in the death of a popular bodyguard. In addition, Annette, Oissel’s granddaughter and heir, insists that he did not commit suicide. Mixed motives and a political scandal all propel a lacklustre police investigation as many people try to find out what really happened. Two women MPs aid and abet the search for truth, as Labour MP Grace Richards uses her wit and intelligence to deflect attention from West and the rather overbearing society hostess Lady Bell – Clinton gets involved. This is an impressive debut as Wilkinson keeps the action moving despite imparting a lot of political themes, of old established politicians and bright younger people emerge. Deep financial problems mirror the truths of a Depression which would motivate Wilkinson’s own political actions. While the reader needs no special knowledge of Parliamentary procedure to enjoy this book greatly, all those with an interest in the actual roles and lives of MPs will find it fascinating. The geography of the House is important, as is the procedures, customs and politics of an MP’s daily life in the early 1930s. Wilkinson was a more than competent writer of what she knew, politics and people, and although her characters are rather straightforward and simple she develops an interesting plot well, using her amateur and easily influenced leading character. I was a little disappointed that she did not examine the impact of women in Parliament in more detail, but the mystery element is reasonably well worked out. Read this book for the mystery, and pick up a lot of knowledge about Parliament and politics of the interwar period. This is an excellent volume in the British Library series, which has done so much to increase appreciation of the popular detection novel of the mid twentieth century. I find the character of “Red Ellen”” fascinating, and I will enjoy looking out her only other novel, “Clash” which I picked up a while ago. I was really surprised when I saw she’d done a murder mystery, as I had not expected it of her! This one sounds fascinating – and impressive to balance the Houses of Parliament detail with a compelling plot.